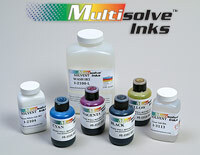 Working hand-in-hand with our Multisolve inks, DCS offers InkMark™, a unique line of coated substrates that are optimized to simultaneously accept our IR4 dye and clear solvent inks in a single pass. The bond that forms between the coating and the YMCK and clear inks provides a more durable image with greater resistance to many perfumes and solvents, including 100% isopropyl alcohol. DCS can provide you with a variety of blank substrates for use with your Direct Jet printer, including: PVC Sheets, Non-Coated Metal Sheets, Acrylic Blanks, Plaques & Awards and Ad Specialty Items.